Quote by Indira Gandhi - "My grandfather once told me that there are two kinds of people: those who work and those who take the credit. He told me to try to be in the first group; there was less competition there." Quote by Vincent Van Gogh - I wish they would only take me as I am. 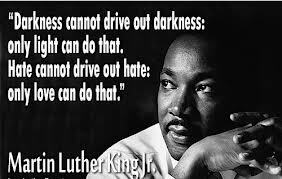 Quote by Martin Luther King, Jr. "Darkness cannot drive out Darkness; only light can do that. Hate cannot drive out hate; only love can do that." Curse cannot drive out curse; only bless can do that. Enemy cannot drive out enemy; only friendship can do that. War cannot drive out war; only peace can do that. Weakness cannot drive out weakness; only being strong can do that. Stupidity cannot drive out stupidity; only cleverness can do that. Cowardice cannot drive out cowardice; only courage can do that. Ignorance cannot drive out ignorance; only knowledge can do that. Foolish cannot drive out foolish; only wise can do that. Complexity cannot drive out complexity; only simplicity can do that. Wrong cannot drive out wrong; only right can do that. Questions cannot drive out questions; only answers can do that. Fake cannot drive out fake; only real can do that. Cruelty cannot drive out cruelty; only kindness can do that. Bad cannot drive out bad; only good can do that. Sadness cannot drive out sadness; only happiness can do that. Bitterness cannot drive out bitterness; only sweetness can do that. Rude cannot drive out rude; only courtesy can do that. Despair cannot drive out despair; only hope can do that. Quote by Ralph WaldoEmerson - "Love of beauty is taste. The creation of beauty is art"